Drop-down lists are the one of the most frequent elements in web forms. In HTML you can create such control using appropriate tags: < form:select > – parent tag of drop-down list and < form:option > – child tag of < form:select > tag. Spring MVC tag library has its own solution for the drop-down lists. 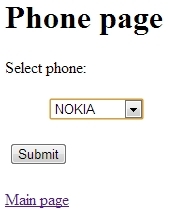 In this post I will write about < form:select >, < form:option >, and < form:options > tags. In the previous articles about form handling using Spring MVC I have made an overview of cases when we need to bind text field, check-boxes or radio buttons with a java object. Almost all steps will be repeated for the select drop-down list element. Further I will examine three situations with drop-down lists in context of binding it with java object using Spring MVC tag library. The first case will be about form:select tag with values based on java.util.Map, the second example will be about usage of form:select tag in conjunction with form:option tags, the third example will be about usage of form:select tag in conjunction with form:options tag. Every example will have the same result jsp page, so only the form pages will be different and controllers for them. Setup of configuration will be omitted because it was explained in the one of previous articles. Let’s assume that user of web application can select a producer of mobile phone (e.g. HTC, SAMSUNG, IPHONE etc). We can implement this in several ways using the Spring MVC form tag library. This class will be binded to the forms. In the selectTag() method I create a Map with values which will be displayed on page with drop-down. The second method processPhone(@ModelAttribute Smartphone smartphone) will be used as a shared end point for the all examples. The second example will use hardcoded value of the < form:option > tag. The last example demonstrates how work with < form:options > tag. Each of these examples is convenient in particular situation and should be used rationally. The < form:option > tag can be used in a small projects where you don’t need a big quantity of options, the < form:options > should be used when you store values of a drop-down in the database or when you need to generate the values in runtime. Source code of the tutorial you can find on GitHub.